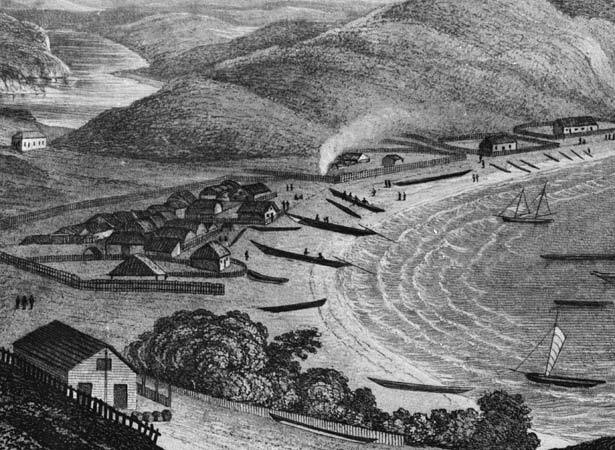 The so-called ‘Girls‘ War’ was fought between northern and southern Ngāpuhi at Kororāreka (now Russell). Up to 100 Māori were killed or wounded in the fighting, after which the northern alliance took control of the important settlement. The conflict had its roots in inter-hapū rivalry and competition for European trade. It was sparked by a fight among some young high-born Māori women, including wives of a European whaler, W.D. Brind. A minor incident led to an exchange of threats between the girls’ tribes. Things turned violent when a woman was accidentally shot. Northern Ngāpuhi led by Ururoa (the brother-in-law of the late Hongi Hika) clashed with southern Ngāpuhi led by Kiwikiwi. The battle was inconclusive but Kiwikiwi retreated to Ōtuihu, a headland about 10 km to the south. The missionaries Samuel Marsden and Henry Williams acted as intermediaries in the peace negotiations that followed. There was intermittent fighting over the next seven years, but Kororāreka remained under the control of northern Ngāpuhi. We have 12 biographies, 2 articles, related to Outbreak of the 'Girls' War' at Kororāreka.